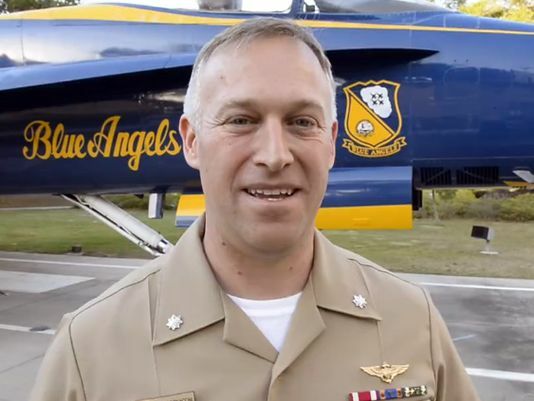 A UC San Diego graduate has been appointed the 2016-17 commander of the Blue Angels flight demonstration team, the Navy announced Tuesday. Cmdr. Ryan Bernacchi was selected by a panel of 10 admirals and former commanding officers. Bernacchi, a native of Los Altos in Northern California, earned his bachelor’s degree at UCSD in 1996. He received his commission through the Naval Reserve Officers Training Corps Program. Bernacchi, who has flown the Blue Angels’ aircraft — the F/A-18 Hornet – – in Afghanistan and Iraq, had been serving as the federal executive fellow at the Massachusetts Institute of Technology. Bernacchi is scheduled to assume command in November.